In 1911, a year after my paternal grandmother was born, International Women’s Day was only celebrated on the date of March 8. In 1980, President Jimmy Carter celebrated Women’s History Week with a formal proclamation. By 1981, Women’s History Week was a joint Congressional resolution. Six years later, the National Women’s History Project successfully petitioned Congress to recognize the insufficiency of one week. Congress agreed and expanded the celebration of women in history to an entire month. This message is a nice segue into the following writers who I think have made their mark on the world changing it forever. The following author list is based upon what was of interest to me in a particular times in my life. I’ve included the authors, the book or writing that impacted me the most, relevant screen or stage adaptations, and recent accolades. What are some authors or books that have changed you or you think changed the world? Isabel Allende is a Chilean writer whose works sometimes contain aspects of the "magic realist" tradition. She is famous for novels such as The House of the Spirits and City of the Beasts, which have been commercially successful. Portrait in Sepia was published in 2002 and was one of the best Christmas presents I’ve received in recent years. Maya Angelou is an American author and poet. She has published six autobiographies, five books of essays, several books of poetry, and is credited with a list of plays, movies, and television shows spanning more than fifty years. Her famous poem I Know Why The Caged Bird Sings is my favorite. Edwidge Danticat is a Haitian-American author who is named one of the 20 Best of American Novelists by Granta, 1996 and has the following accolades: Pushcart Prize for short fiction; American Book Award, Before Columbus Foundation, for The Farming of Bones ; fiction awards from periodicals, including Caribbean Writer, Seventeen, and Essence ; Lannan Foundation Fellowship, 2004; Story Prize for outstanding collection of short fiction, for The Dew Breaker, 2005. The Farming of Bones is a work of historical fiction and the first book I ever read by Danticat- it changed me forever. Amelia Mary Earhart was the first female pilot to fly solo across the Atlantic Ocean. She wrote best-selling books about her flying experiences and joined the faculty of the Purdue University aviation department in 1935 as a visiting faculty member to counsel women on careers and help inspire others with her love for aviation. She was also a member of the National Woman's Party, and an early supporter of the Equal Rights Amendment. In 2002, Sally Putnam Chapman the granddaughter of Earhart's husband, George Putnam, donated 492 items – including rarely seen personal and private papers, such as poems, a flight log and a prenuptial agreement – to Purdue Libraries' Earhart collection. 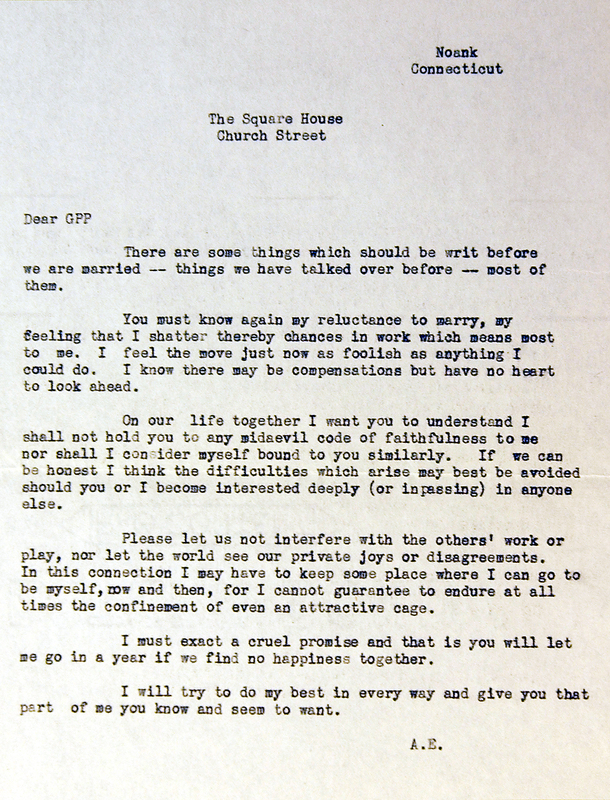 On the morning of their wedding on February 7th, 1931, Amelia Earhart wrote the following letter and saw that it was hand delivered to her publicist and fiancé, George Putnam — a determined man who had recently received a "yes" following his sixth marriage proposal to the world-famous aviator. Giving that answer had clearly been incredibly difficult for Earhart, and as a result she chose at the last minute to formally clarify a few points on paper and essentially announce the beginning of a yearlong trial marriage. Of course Putman agreed. This letter fascinates me and reminds me that Earhart was truly a woman before her time. Wow! Really enjoyed that personal letter written by Amelia! Nice post! Thanks! They are truly inspirational! I loved the letter from Amelia Earhart. Thanks! It is incredible! I am glad it moved you too! President Obama recently signed the Lilly Ledbetter Fair Pay Act to help women fight back against pay discrimination. I am glad the letter moved you like it moved me! Wow, what a fantastic post! Such inspirational women! Thanks for sharing this with us! Thanks! It was my pleasure! I loved learning a little about these very strong women! Kudos to them all and to women everywhere! Amelia certainly made a statement in her letter! I am glad it moved you too. Thanks and best wishes to you. Thank you for this...these are all very powerful and inspiring women! I love Maya Angelou and her writing. I agree, that the Amelia Earhart letter was strong and fascinating! I truly hope you all had a good time, and I can't wait to be able to do this again...ok, I CAN wait long enough to recover, but not too long after that. But the next time, oh yeah baby, I am giving myself at least a week of getting ready.